Today, the last day of 2011, is a Saturday. What a year. I’ve not blogged in a while, as has been the recent trend, not that I’ve not been collecting material. So, it’s a great time to share a review of recent, and not so recent events, as some of them are quite awesome. As for the year to come? Well… that’s for another post, but I suspect I’ll be reading more classic literature, traveling more, and studying for a wine certification…I hope. Enjoy the photos! WINE: I transformed my career, somehow, with luck, with some concrete planning, with hard work. I went from an online marketing/editing/PR drifter and hopeless fiction writer, who worked part-time doing wine tastings, to a wine bar sommelier and cook, to an invitee representing the winery in a French exhibition, to a full-fledged winery employee. I’m proud of myself for going for something I wanted and succeeding. You never know what was entirely based on chance, but I know that whatever had happened, I would be working full-time in wine at this moment, whether at the winery or a restaurant or a hotel. I learned how to leave a job I hated, work hard, ask for help (which was not easy), and ask for what I wanted (which may have been even harder). I love my new job. Christmas Day: Katzrin, Israel. Visit to the winery. I'm pouring our Yarden Heights Wine 2009, a Gewurtztraminer ice-wine-style dessert wine. Yummy. Christmas: Yonatan vineyard, Golan Heights. Organic Cabernet Sauv. TRAVEL: Hmm… where did I go… Bordeaux, Paris, Giverny (in Normandie), Chicago, Kauai… I changed planes in Amsterdam, Philadelphia, and Los Angeles – though those aren’t supposed to count… and that’s it. Fantastic adventures…but not as far and wide a selection of places as in years past. I was very privileged in these, however. They really were incredible trips. Wine, food, laughter, hard work, hard play, art, beautiful weather – always – and especially the interesting people that I traveled with and met along the way. (on an interesting side note – after having been featured on an American Travel Channel television show, I was recognized all over the world, by random people, some of who plotzed and took photos with me and my sister). 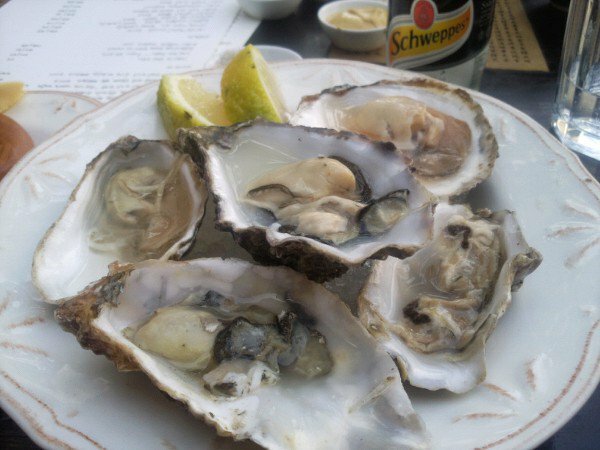 April & June, Tel Aviv & Bordeaux: OYSTERS! Huitres! FOOD: I cooked less this year, but ate just as heartily. Perhaps too heartily. The most typical New Year’s resolution may be in order for me this year. From scrummy wine bar fare like prosciutto & Parmesan, fatty French cheese platters, and freshly steamed Thai dumplings; to oysters, foie gras, chestnut creme crepes, Armagnac ice cream, crisp lemon squid, a simple Chateaubriand steak I’ll remember for a long time, more hearty soups than I can remember, and much much more. 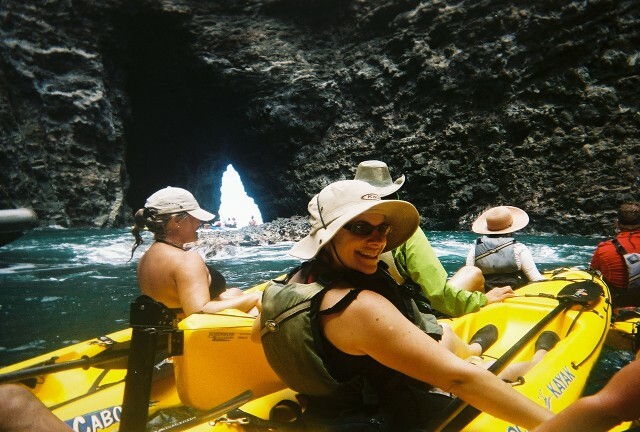 KAYAKING: an odd adventure sport I picked up and stuck with. I suppose I needed some more exotic expensive exercise-induced adrenaline in my life. 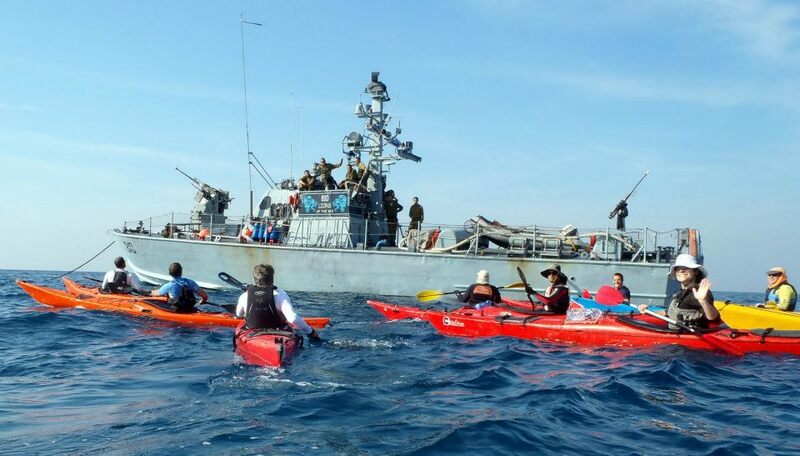 Begun as a crazy lark in Hawaii (the Na Pali coast is rated the #2 adventure to take part in by National Geographic), I was thrilled and proud I survived the craziness, I decided to roll with the momentum and immediately join a kayak club in Tel Aviv. It’s been interesting, and terribly challenging. It has added another dimension to this ever-changing life. It has also added painful dark bruises to my legs and arms every week, and taken a large chunk out of my paycheck for water-tight clothing. Oh well. Life. Better to go for it than to sit on the sidelines. AND let’s end the year with some videos! Going along with the title of this post, Tom Lehrer wrote some excellent songs that still ring true today. In honor of all of the revolutions this year, in Egypt, Syria, Yemen, Tunisia, and Libya. In remembering all of the precarious situations that remain, Iran, North Korea, the Euro-zone crisis, the upcoming American elections, the environment going to hell, flu, honeybees dying out, and Israel practically becoming a misogynist theocracy, and of course the future of my physical, mental, and especially social fitness. Let us hope, but more importantly, let us work hard for a better year and a safer, happier world. And here’s some laughs and satire for us all. Fabulous clothing and shoes, wine stains and crushed toes. So the game goes. Israel and wine, newsworthy topics both, best when paired. The Sommelier Exhibition 2011 has come and gone, and it was fast, busy, exciting, exhausting, and over as soon as it began. We at the Golan Heights Winery featured the 2008 Vintage – including 3 new single vineyard wines that were released this week, timed with the event: the Merlot from the Kela vineyard; the Syrah from the Tel Phares vineyard; and the Cabernet Sauvignon from the famed El Rom vineyard. We also introduced the Gamla Syrah 2009 (English), the newest addition to the Gamla series, a long time in the works – brilliant magenta color, vibrant fruity aroma bordering on the confectionary (and I mean in the best possible way), and such a fun wine it is. The jazzy new 2008 Yarden 2T, a blend of two Portuguese varietals Turiga Nacional and Tinta Cao, was also a huge hit – lighter bodied yet complex, something we Israelis are not used to… and should be a great pleasure to get to know. In other fascinating wine news, I read this interesting piece on 8 Budget-Friendly Destination for Wine Lovers. 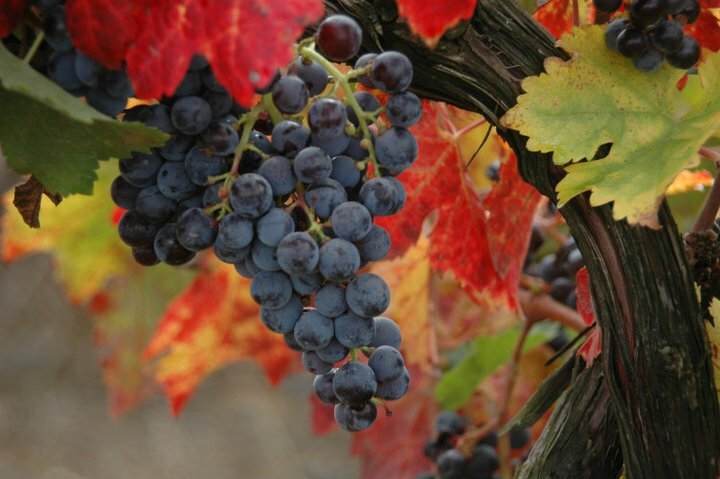 Ever thought of going to Thailand for a tour of wine country? Umm… never. But for $50 a tour, $5 a bottle, and a hotel for $15, your plane ticket is your largest expenditure (which frankly, is not small potatoes, but we’ll ignore that). Apparently it’s brilliant fun to see Thailand’s 3 wine-growing regions that are able to harvest twice annually because of the wet and hot climate. All the others I’d heard of and have actually considered. 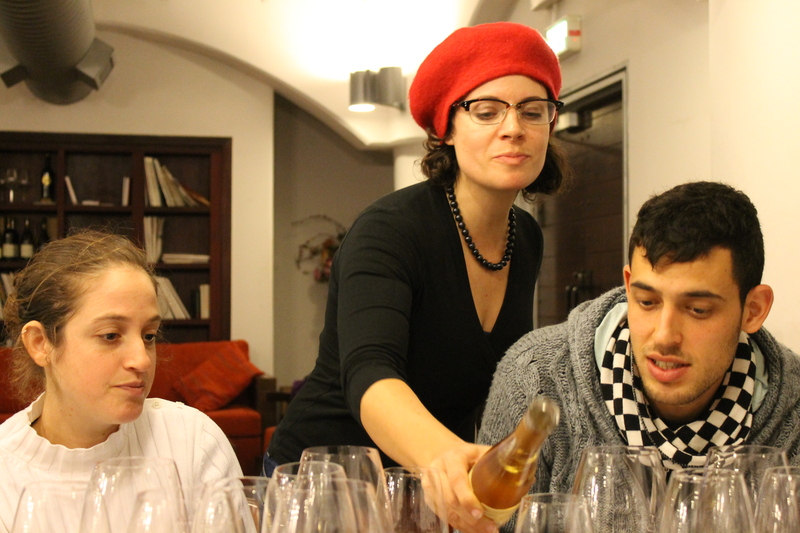 Hungary (Tokaj – now why in the world wouldn’t I?) and Cyprus (fascinated by Greek-Turkish wines – millenia-old traditions) especially. OK – on the bizarre, awesome, I-never-would-have-thunk-it, front, a Japanese comic book (the genre is known as Manga), all about wine – “Drops of God.” First published in 2004, it’s been translated into English, and it’s brilliant and fascinating. Wine Manga. Wow. It was a smash hit in France, a sensation in South Korea, and it introduced wine culture to large parts of Asia. Check out the article and the Wikipedia page. I’m buying this. 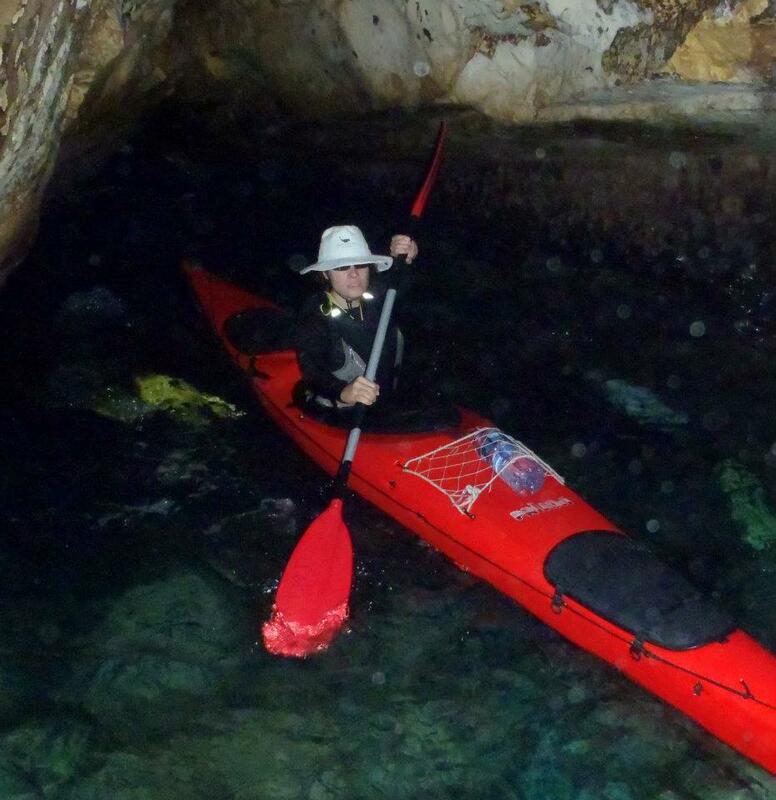 Otherwise – I’ve been working and kayaking and that’s about it. Mostly working. And consuming junk food, cucumbers, and tuna fish sandwiches. Ah life. And wine, don’t forget the wine. My teeth turned an absurd shade of nasty smeared blackish purple over the past two days at the exhibition (not because I drank, god forbid while I work, at least not much) but because I was designated taster for most of the time – testing for oxidized and corked wines. Thank goodness for baking soda. So much to tell, so little time! I am flying to the USofA today! But I will be spending less than 35 hours of it (cumulatively) on the contiguous 48. That’s right. My family and I are off to the gorgeous lush relaxing island of Kauai, the northernmost (and slightly less touristic) in Hawaii. It’s hard to believe. I’ve been working 18 hour days for a week now preparing for leaving, and now I’m leaving in about 10 hours, and I’m still working, and I haven’t started packing or cleaning or anything. I’m going to end up on a beach, completely strung out after 2 days of endless flights, and not know how I friggin got there. Oh well. C’est la vie. And I must say, I’m liking my vie very very much these days. Now if I could only catch some more zzz’s and do better catching up on work and studies. But I’m lucky. Quite. 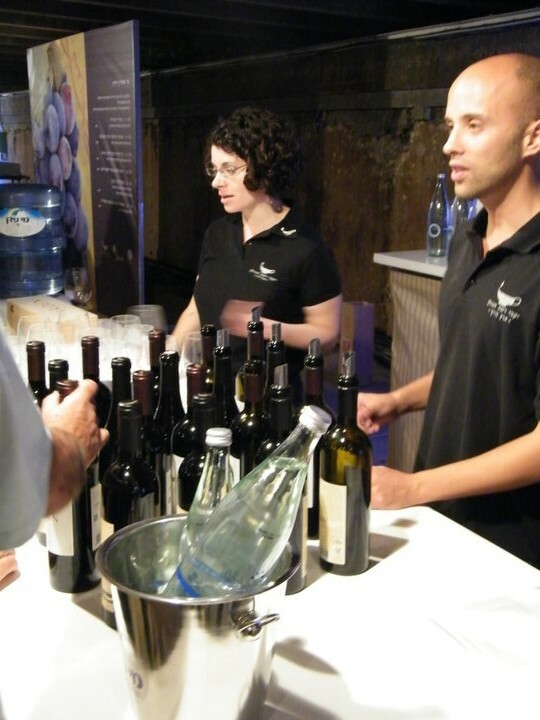 Last 2 days of the Jerusalem Wine Festival! It’s at the Israel Museum tonight (17/8) and tomorrow (18/8) from 7pm-midnight. You pay about 70 nis at the door, get a lovely Riedel glass (that you get to take home with you if you haven’t broken it yet), and drink endlessly from your choice of 30+ Israeli wineries. 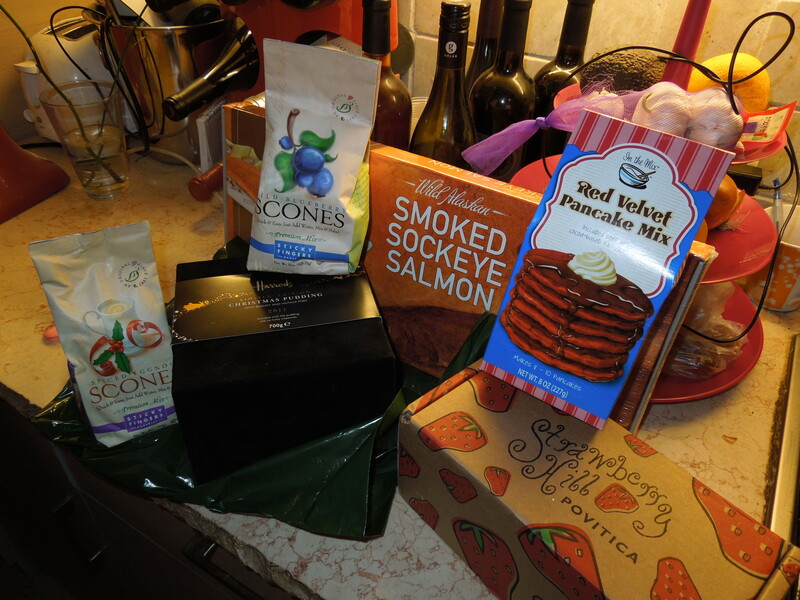 With Jacob’s fresh cheeses and locally made gourmet chocolate also at hand, it’s a fun time. I managed our stand the last two days, and all I have to say is GAMLA NEBBIOLO. If you’re reading my blog, which hardly anyone does, but if you do, and you go, ASK FOR THE NEBBIOLO at the Golan Heights stand. It’s under the counter. And it’s incredible. The Jewish High Holy Days are coming up. If you like wine at all (and I’m assuming you do if you’re reading this), it’s the best time of year to taste almost every wine you’ve been curious about. Pesach and Rosh Hashana are the biggest wine sales events – so the week before you’ll find free tastings at almost every wine store and supermarket in the country. So go! Explore! Drink! This is everyone’s chance to expand their horizons without having to leave their own neighborhoods. 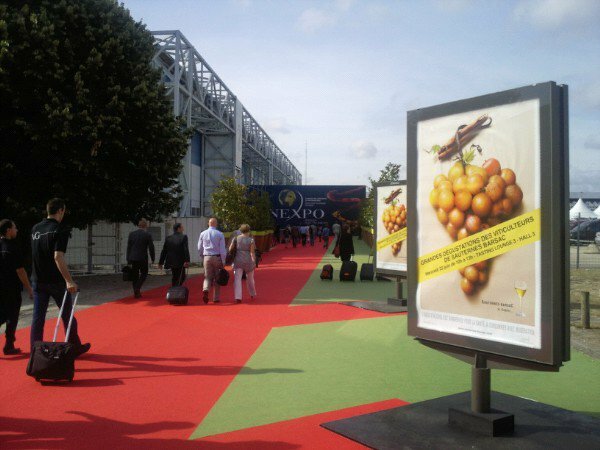 Overview: Founded in 1981 by the Chamber of Commerce and Industry of Bordeaux, the Vinexpo has emerged over the years as the great meeting place for global operators of wines and spirits. The expo takes place every other year in Bordeaux at the fairgrounds. It takes place during one week in June every odd year and welcomes some 50,000 visitors, and hosts 2400 exhibitors from 47 countries. The main exhibitors are French and Italian. In 2011, one out of three non-French exhibitor was from Asia, and recorded 48,122 visitors from 148 countries, up 3.22% compared to 2009. 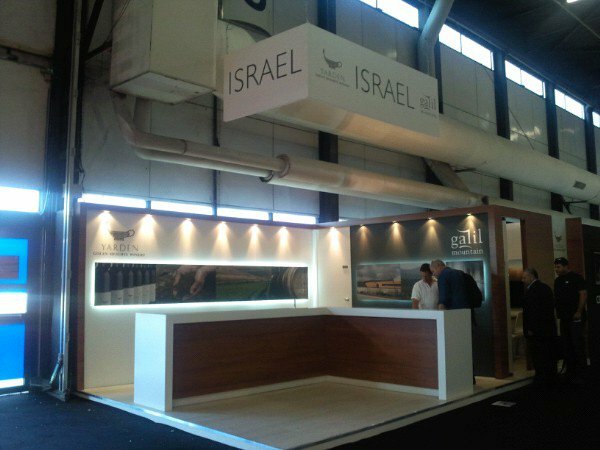 The GHW and GMW booth at Vinexpo with Head Winemaker Victor Schoenfeld and Director of Sales and Marketing Arnon Harel. I was honored with an invitation to come and work at the expo by the Golan Heights Winery. They have been exhibiting at Vinexpo for at least 20 years, as far as I know, the only winery – at least this year – from Israel. This year, we also brought wines from our daughter winery, The Galil Mountain Winery. I speak French fairly fluently (I lived in Paris as a child, grew up in a loosely tri-lingual household, and continued my studies through high school and university – where I focused heavily on French literature), but needless to say, my wine vocabulary was lacking. I spent the two months before attempting to brush up – listening to French news radio on the internet, and I found some Skype-pals, for lack of a better term, through a free service that pairs up people wanting to improve their foreign language speaking skills through an exchange with native speakers, online. A fantastic idea. I also created lists of wine vocabulary, watched wine-making videos on YouTube, and I did some research on wine websites and wine regions in France, simply to read about these topics in French. It all helped. I was a bit overzealous in my preparation and overly nervous about my ability to perform, but I think I did well. The first day I felt I was a bit shaky – but after a glass or two of wine and hours on end of speaking just French, it came very easily. I was there to pour wine, explain about our wines in detail, and introduce whoever was interested to what Israeli wines really are. A great fun very professional exhibition. I met wonderful people, and I learned a lot, too. 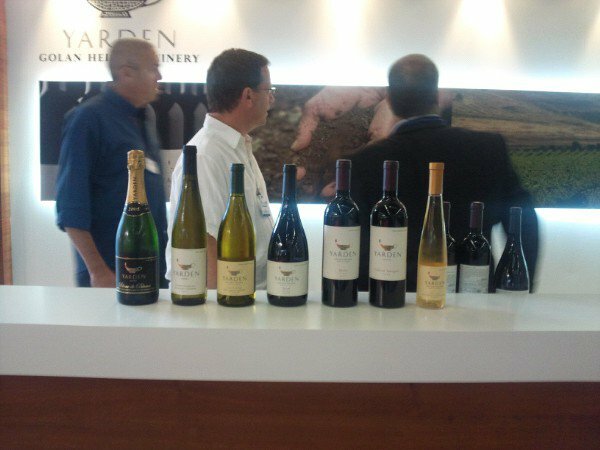 Golan: Yarden Gamla Brut 2005; Yarden Gewurtztraminer 2010; Yarden Chardonnay Odem Organ Vineyard 2009; Yarden Syrah 2006; Yarden Merlot 2007; Yarden Cabernet Sauvignon 2007; and Yarden Heights Wine 2009. 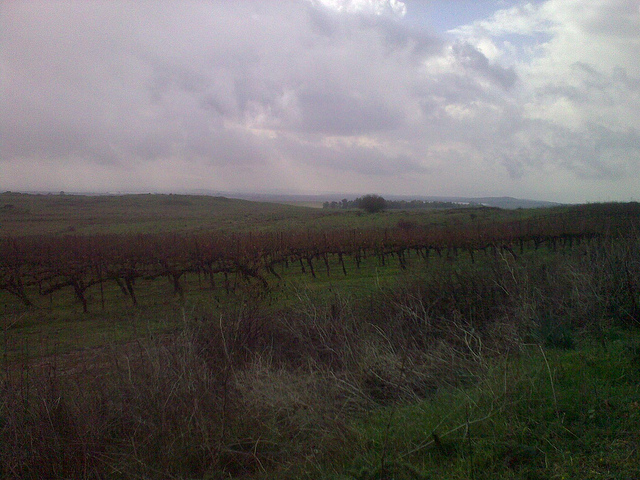 We also brought a hodge-podge selection of 2-3 bottles of various other wines to share with journalists, specialists, and international distributors, if the moment arose – from the Golan range, through Gamla, and a few special single vineyards and top limited-edition wines like the Rom and Katzrin. Galil: Sauvignon Blanc 2010; Viognier 2010; Avivim 2009; Pinot Noir 2009; Meron 2007/2008; Yiron 2007. There were also some random bottles opened on occasion, if memory serves, perhaps some of the younger reds. As the only French speaker, I found myself at the stand so much that I didn’t see much of the rest of the expo. Frankly, that was OK by me. Victor, the head winemaker, worked extremely hard, too, as well as some of the others, and when you get into a rhythm, adrenaline kicks in, and it’s extremely fun work. A real team effort. We had “Wine ID Cards,” as we call them, with all the stats on the company, the numbers, and the geography, complete with map, as we used as a starting point to explain about the location of the vineyards and the specific terroir. What I found surprising was the people were incredibly open-minded. I think that a number of them simply came out of curiosity, the novelty of an Israeli winery, but the fact that we’ve been winning very important awards, especially as of late went a long way, too. People loved our wines. The most “negative” comment I got was that it was very different than what they make in France. Perhaps they were being polite. However, the rave reviews some people offered up, who came back for seconds, who finished their glasses instead of using the spittoons, were not uncommon, and it was energizing. I was so happy to be there. Honestly, I was so proud to be there. 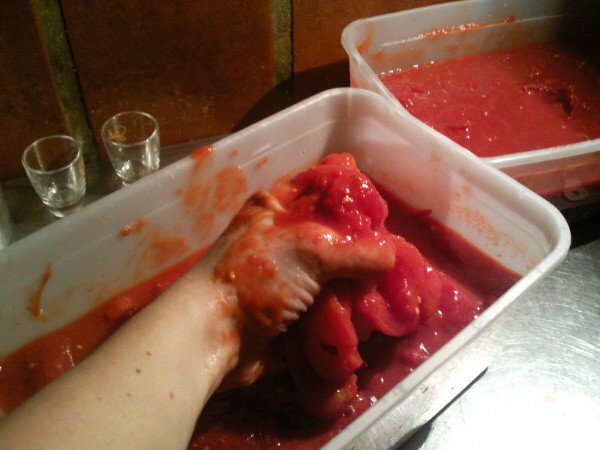 And to be spouting off facts, figures, agricultural specifics, aging techniques, standing right next to the winemakers – hopefully getting it all right (I certainly prepped enough) – was something else. I feel I proved something to myself. I’ve come very far in just two+ years in the trade. I’m actually able to teach things, and in some ways also to inspire. I love these wines, and I love the people I get to work with even more. Lebanese wines: SO different from Israeli wines, and such a small distance away, it’s surprising (almost all of the wines are made in the Beqaa Valley). I found them sharper somehow. Very different layering. A lot of the wine wasn’t amazing, I have to admit, as younger wines always are. However, among the young wines, there was a lot of creativity – fresh and bright. The vines in Lebanon are older than ours, at least some of them. Because Lebanon is not a dominantly Muslim country, there have always been Christians there – I met a lot of people who had vines that were decades and decades old. A big positive factor in the quality of the grapes. Of course, there are also a lot of new ventures. I met French winemakers who were hired by Lebanese and Syrian businessmen who wanted to build up wineries as an investment in recent years. The wines I tasted that I remembered most were from Chateau Ksara and Château Kefraya. Japanese wine: no, I’m not talking sake. I’m talking real true blue wine from grapes of the authentic Vitis vinifera. They don’t yet have a website, the wine is in such limited production, and for the life on me I cannot remember the name. Crazy. I will find out, though, as I know some people who know some people and I will update soon. Perhaps I’ll write a post on it. What I remember is this: it was distinctive as hell. I don’t know whether I loved it or hated it. Not kidding. There were two wines, one younger, one more aged – premiere, both white, very fresh and sharp. What was distinctive first was the smell. It was like stinky bleu cheese and fresh green melon. Weird. I mean so weird, I felt like my facial expression might have insulted the women representing the winery. They served sushi with it. The taste was so contrary to the smell, that was the next oddity. Very floral and green. They were saying that the specific grape varietal was native to Japan and had been evident in records for over 1,000 years. 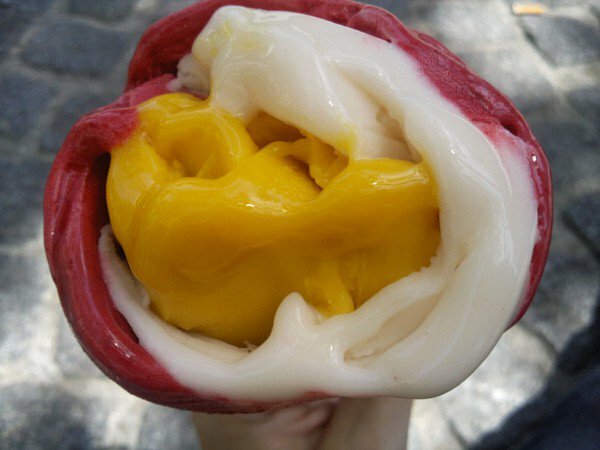 How this fruit came to Japan that long ago is a mystery. On the wings of a bird? On a rare random trade ship? Because it is the real deal species. Not a different fruit. I will find the name, promise. Chablis: I tasted the whole lineup of wines from the Durup family’s winery. It’s good solid decent Chablis. I liked the Chablis 1er cru Vau de Vey very much, although I must say that their Petit Chablis was just as lovely and drinkable. For people who want a fun summery wine, and aren’t wanting to break the bank, it’s a great choice. Sicilian wines: I tasted a big-commercial-winery’s wine from Sicily two years ago and was blown away. Since then I’ve kept my eyes open for Sicilian wines in Israel. This wine was so rich and deeply fragrant, reminiscent of cassis (black current), that I was kind of in heaven. Cassis reminds me of France and England and childhood and fruits from other-parts-of-the-world, not the standard everyday variety. Needless to say, there aren’t many Sicilian wines available in Israel. I got a chance to taste many many Sicilian wines at the expo. In short, there are volcanic regions on the island, and surprisingly enough, non-volcanic regions, too. The wines are dramatically different. The dominant local varietals are Nero D’Avola (red) and Inzolia (white). I was pleasantly surprised by the whites, as I hadn’t tasted them before. Because of the sort of “transparency” of flavor inherent in white wines (for even the beginner, it’s easier to detect differences between white varietals than red ones, at least in my opinion, and they are easier on the nose, if that makes any sense) – I felt I was tasting something so new yet so ancient. I don’t have my notes in front of me, unfortunately, but maybe I’ll do a separate post on it, too. 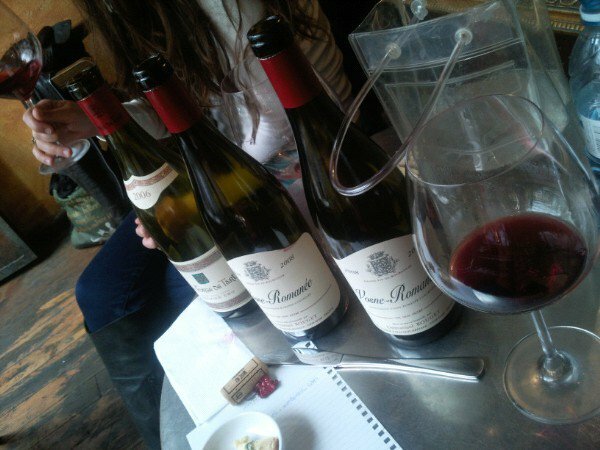 Burgundy: Tasted some, people were pretentious, the wines weren’t at the correct temperatures, by a long shot , and I didn’t have a good time. I moved on quickly. So I can say I drank a glass of grand cru. OK. My notes are elsewhere, and that’s OK by me. Bordeaux: Besides the two stands I stopped at, we drank Bordeaux wines all week at dinner. There is a reason that these are the kings of world wines. Even the youngest wines are so distinctive of this region. The layers and complexity are fascinating and at the end of the day, delicious. At one of the stands, a young man took me through a very interesting tasting. I got to taste, albeit two simple wines, ones that were made a few meters from each other, from the same vintage, made in the same method, by the same winemaker. And the differences were dramatic. An exceptional lesson on terroir, for sure! 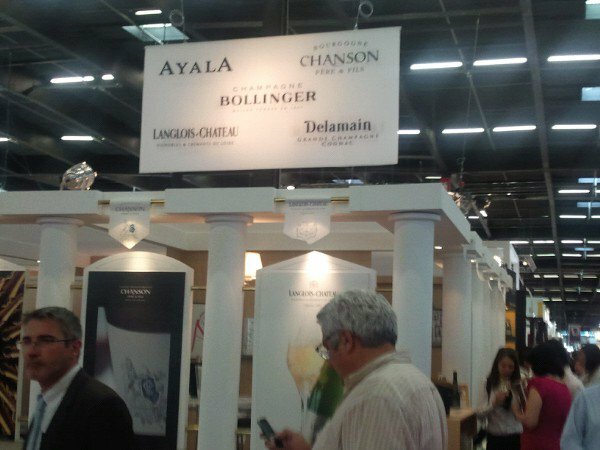 Vinexpo – Bordeaux, France – one of the largest (if not the largest) wine exhibition in the world. Kilometers long. Immense. Exciting. And the Golan Heights Winery (and its daughter winery, Galil Mountain), the only Israeli winery represented (and has been for over 20 years), invited me to come with them. A brilliant week! I spent my days speaking French with lots of wine professionals and led them through “une degustation,” a tasting, and teaching them about our wines. I got to know the head winemakers and management well, which was so much fun – it honestly started to feel like a school trip….and the eating and drinking through the city like there was no tomorrow was certainly a perk. Paris – I spent almost a week in Paris after the expo – two/three days of which was with my parents who happened to be in town, unplanned. I spent time with family friends, too, walked all over the city, relaxed, and ate very very very well. New Job! 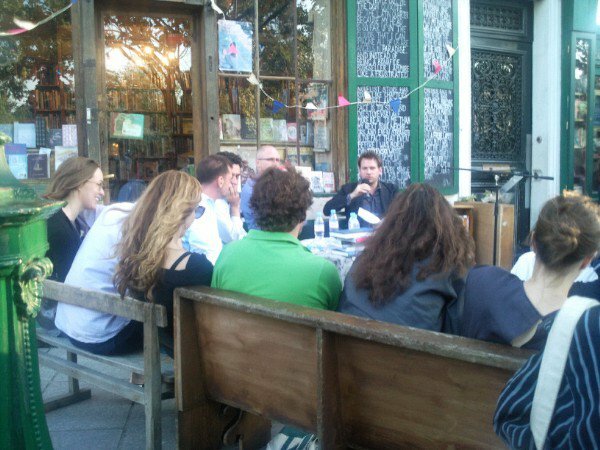 The winery hired me to manage, train, and recruit all of the wine stewards in Israel. This is a huge honor, and it’s a job I’m loving. It’s not easy, but it’s mainly logistics and some training. New love – a beautiful, exciting, and ultimately sad story. I met a man that I’m crazy about. It has been one of the most emotionally satisfying, significant and devastating months of my life. He is leaving to go abroad for a very long time (years) in two weeks (we will have had about 5 weeks together). I’m not sure how I’m dealing with it all. With the new job I love and a career I’m trying to forge, I finally accepted the fact that I’m staying here and putting a stake in this place. Come one, come all! 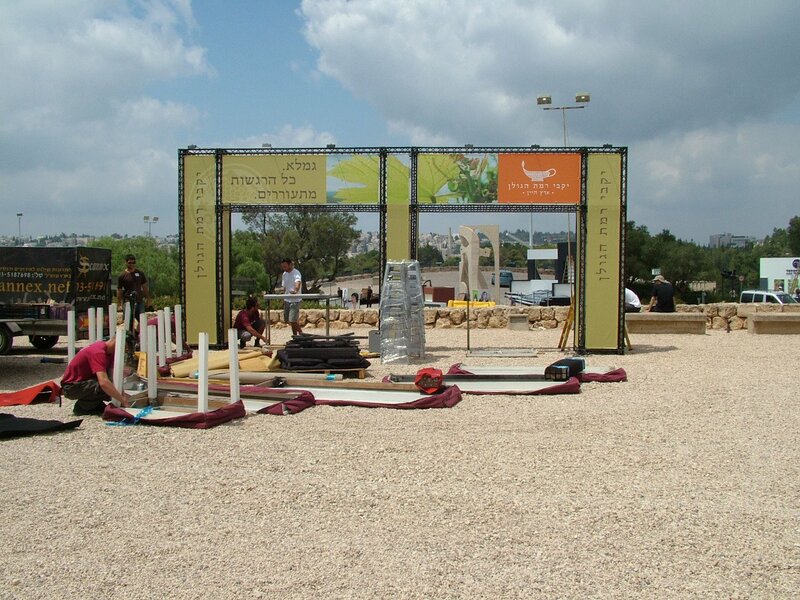 From tonight, Saturday May 21 to Saturday May 28, the Golan Heights Winery is presenting their incredible yearly wine extravaganza at the port of Tel Aviv. There will be 6 separate themed bars, and each cost only around 30 shekels to sample all four (or more) wines featured there. 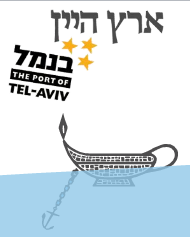 All of the information online about the fest is in Hebrew. However, it’s going to be fantastic. The winemakers themselves are going to be there. We’re opening top-end wines that are not yet on the market. There are free workshops every night. Blind tastings. The works. Day 1 was incredible! I got to open a Yarden Rom. That's right. Rom. Basically, be there or be square. You can come for 20 minutes, you can come for 4 hours. It’s simple. As it’s free to get in (it’s at the namal, after all), you can pick and choose exactly which of the 6 experiences you’d like to have. Starts at about 7 pm every night (except Shabbat, when it’s after Shabbat ends, around 8 pm). The Israeli voting booth: archaic or effective?